You are here: Home / Blog / Cosmetic Dentistry / Another Dental Implants Patient at Cancun Cosmetic Dentistry! Let’s look back at one of our patients. Ken has been coming to use for a while now and are always happy to see him for his checkups. He had gotten dental implants and crowns and now sports a wonderful white smile. Before, he used to not like his teeth because he couldn’t eat well. He wished to be able to eat without worrying about pain or their looks. 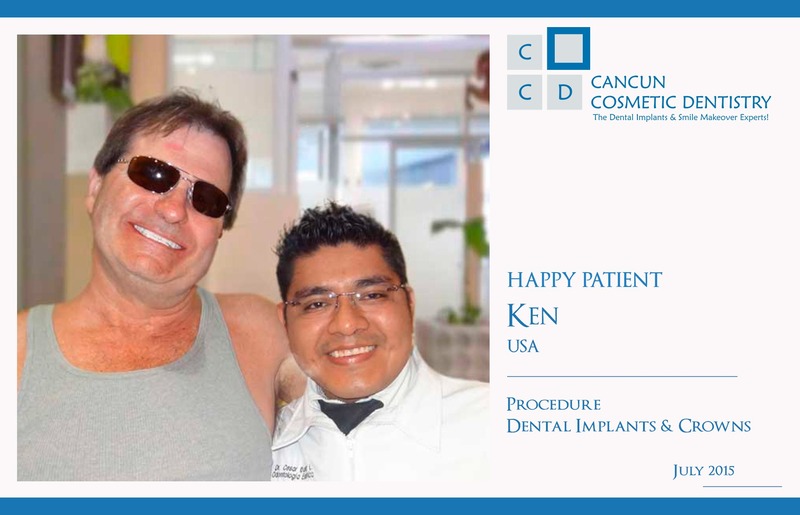 He found out about our services through our webpage and decided to come to our Dental Clinic in Cancun to get his dental implants. He’s pictured above with our Mexican Dentist Cesar Ibañez. Dental implants can be used to replace one single tooth or could even be used to set a bridge. There are also some very versatile techniques used to replace all the teeth with an implant supported permanent denture; these are the All on 4 and the All on 6 technique. The All on 4 can actually be used on patients with little bone density that are not candidate for regular placed implants. Submit your x-rays so we can make a personal FREE evaluation to tell you what is the best solution that better fits your case. Dental implants in USA can reach up to $3,000 USD per implant, without abutment or the crown. That’s not what we do here. We use FDA approved Titanium dental implants (the same implants you would get in USA) but they are $990 USD each. With the abutment and crown placed on the second visit, it would only be $1,750 USD. See the difference? You can actually save thousands of dollars by having your teeth done during your vacation in Cancun. What is not to love? Doctor German Arzate at Agora Gallery - "Fragmented Reality Exhibition"
Avoid these foods that contribute to poor oral health! Shocking Link Between Hormonal Changes And Gum Disease! You can also get affordable crowns in Cancun!